WE GRANT YOU 3 WISHES! It's your horse, shouldn't YOU be able to ride it? Sending your horse away to a trainer sounds like a remarkable solution but often times your horse returns home with the same issues. Of course the horse behaved at the trainers, they're a professional. Three Wishes approach is different, we provide you with the skills necessary to communicate fairly and effectively with your horse, at your home or stable. Three Wishes Traveling Natural Horsemanship offers the support you need while you develop the confidence and skills required, to build a solid foundation based on trust and respect with your horse. We'll show you how to listen to you horse, as much as you would expect them to listen to you. Only then will you truly be able to enjoy each other. ​We offer the best Natural Horse Training experience and take great pride in working directly with horse owners and their equine friends to promote and provide every horse owner with a calmer, happier, and more willing horse partner. All of our students, weather four legged or two, learn the basics of respect and kindness towards one another. We believe in empowering owners with the skills necessary to establish a relationship in which the horse wants to do what their rider asks, naturally and without force or fear of punishment. ​Are you ready for the ride of your life? 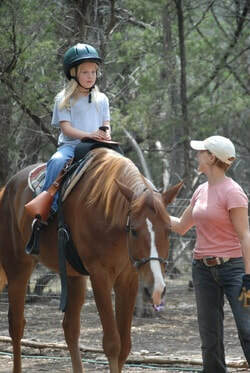 Private Natural Horsemanship Training, Lessons & More! Our techniques are very similar to those of Pat Parelli, Clinton Anderson, Buck Brannaman, John Lyons, or Chris Cox. * Though we do not claim to duplicate THEIR programs. I have been having Lindsey with Three Wishes work with me and my Rosaleen for about 3 weeks now and I am amazed at the progress we have made. This is a work in progress with my highly sensitive rescue horse. We are in this together and Lindsey's techniques she is teaching me have brought us closer in our relationship. When we first started I couldn't approach Rosaleen at all and now, after only 3 weeks I can approach her, rub her all over, brush her, put a halter on her and lead her. All without anything that cause stress to my horse. She is so willing and comes to me now. She wants to be with me now and I love that I can spend quality time with my horse. Of course it also requires doing the work with her everyday before Lindsey visits next to teach us more. I am looking forward to what comes next in our training. I am learning so much and so grateful to Three Wishes. I highly recommend Three Wishes to anyone who needs help with their horse. Don't give up on your horse! There is help out there! Contact Three Wishes today! "Three Wishes Traveling Natural Horsemanship has the best trainers!" Contact Three Wishes today and schedule your first appointment!